Don't miss my listing program overview as well. A solid real estate marketing plan is very important. It takes more than a MLS listing, sign, some paper fliers, and an open house to sell your home in today’s market. Make sure your real estate agent has real leading edge housing market intelligence. 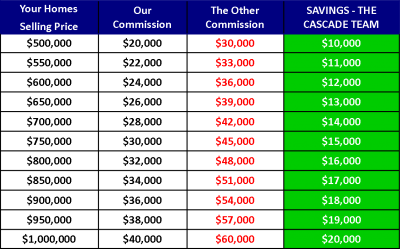 Take a look at our quick video and then scroll down to see everything we offer our home sellers for only a 1% listing commission. Our leading edge marketing plan is designed to sell your house as quickly as possible. Professional HDR Photos, Aerial Drone Photography for acreage properties and fully interactive 3D tour! A complete multi-page custom website for each and every property that is listed for sale with The Cascade Team Real Estate. The Cascade Team populates all our listings to the Bid This House online offer submission platform to make it easier for buyers to submit offers on your home. Buyer traffic is increased to your listings. The property information and a link to the property website is fed nightly to the best and most popular classified search sites. When your agent is online, a CHAT icon will appear on your property website so anyone visiting your property web site can chat with them and ask questions about your home with just one click. Tours are automatically created from your Gallery pictures. I can customize your tour by adding text, adjusting zooms, adding more pictures and selecting music. Buyers can text for more property info about a listing right from their car, and all of the data including the mobile website is texted right back to their mobile phone in an instant! The Cascade Team Real Estate is pleased to announce the launch of our FREE mobile mls and home for sale search application. This new application is not just for iphone, but also works on Blackberry, Google and Droid smart phones, along with most other web enabled devices. No longer are you bound by limitation from one phone or one carrier, as this application works with all smart phones and all carriers. It's why we say, "All Phones, All Carriers, Every Listing!" You can see every listing in an area via our GPS map enabled search feature. So download our FREE application now and stay in touch with real estate and homes values in your area. As potential home buyers text for information on your property, we can notify them of an impending open house or a price change on the property by pushing them information via text. We showcase your home with our Facebook listing widget. Place the property scrolling widget and a "Homes For Sale" tab on your profile; they link directly to your property websites. Social Networking is the fasting growing form of media in the world today. It has quickly become THE way people find out about New Products, News, Events, and how we stay connected. The Cascade Team actively promotes your Home, Open Houses, and Events using advanced Social Media programs! 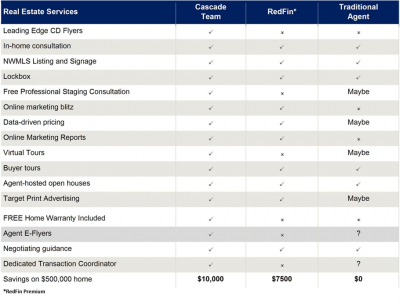 The Cascade Team’s proprietary CD Flyers provide maximum information for potential buyers. Beyond a few pictures and a piece of paper wet with rain, our CD Fliers provide up to 100 photos, the virtual tour, school reports, neighborhood information, walkscores and more….. And they provide reporting so you know how well they are working! View where the hits to your website are coming from as well as the Unique Visitor Counts to each and every website page by date in chart form. Every property has a full showing feedback system that sends a questionnaire email and charts responses from showings. Sellers can manage and view the feedback at any time with a secure login. Have a professional eye, view and stage your home for maximum impact and that all important FIRST IMPRESSION! Each home receives a full consultation by an Accredited Staging Professional and a detailed report tailored specifically for your home. Get an immediate home value report in your inbox. Whether you are looking for the value of your existing home or for the new home you are looking for purchase, this report will provide you with actual active and sold MLS home information so you'll have "real" housing market data at your fingertips. This report will come every two weeks and will provide you a snapshot of home sales activity in your neighborhood. If you are interested in purchasing in a specific area, this information will show you the active homes in the market, price trends and close values on homes that have sold; allowing you to do a comparative analysis of real estate and homes for sale in that area. Stay up to date and have information your neighbors don't have. Sign up for this FREE report today. The Cascade Team provides all our MLS listed properties open houses and broker’s opens, and we also host Virtual Open Houses featuring website chat and virtual tours of your home. If your real estate agent isn't offering you all the tools mentioned above, don't hesitate to give me a call. I'll implement our cutting edge real estate marketing plan to sell your house fast! Fill out the form below and I'll contact you with more information. When you're ready to take the next step toward selling your home, I'm here to help. Our comprehensive marketing plan will get your home seen by thousands of motivated buyers.